Girl Scout Cookies are a beloved treat that most of us look forward to every year, when Girl Scouts across the country start selling them outside malls and grocery stores. Part of the reason that the cookies are so appealing is that you can’t get them any other time of year, which only seems to make people want them more. 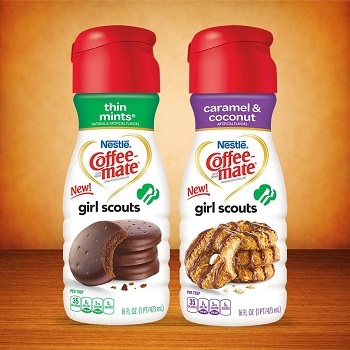 If you can’t wait until the next cookie season to get your Girl Scout cookie fix, you might want to pick up a bottle of Coffee-mate’s just-launched Thin Mints® and Caramel & Coconut coffee creamers. One is based on the Girl Scouts’ best selling Thin Mints, while the other is based on the popular Samoas cookies. The creamer should be available at Target, and as it rolls out to more retailers, you should be able to pick up bottles at other grocery stores in your neighborhood.